Shoot are already coming through in this pot all ready for spring. Ventilate, on dry days open the door, this creates air circulation and helps reduce mould and fungus. Wash the glass, this increases light and keeps your plants healthy. My viola and Cerinthe seedlings are getting larger and the salad crops have come on well, if you have let them get a little mature don’t worry they are still great in a stir fries, add them at the last minute. All of my over wintering plants are still flowering in the greenhouse, Perlagonies, plumbago and Tibochina. Water everything sparingly without getting foliage wet. Don’t forget to mist all house plants now we have the central heating on. Early indoor bulbs need to be kept damp and warm and plenty of light, its never too late to pop some in a pot, the results will be amazing in the dreary days of January. Perlagonimums make great greenery for Christmas flower arrangements and if left in fresh water with root ready for next year! Continue to clean and clear veg patches and stake vulnerable plants like broccoli and Cavolo Nero. I am harvesting leeks, greens and parsnips and still have enough raspberries to top cup cakes and to pop in drinks. You still have time to harvest from apple trees. 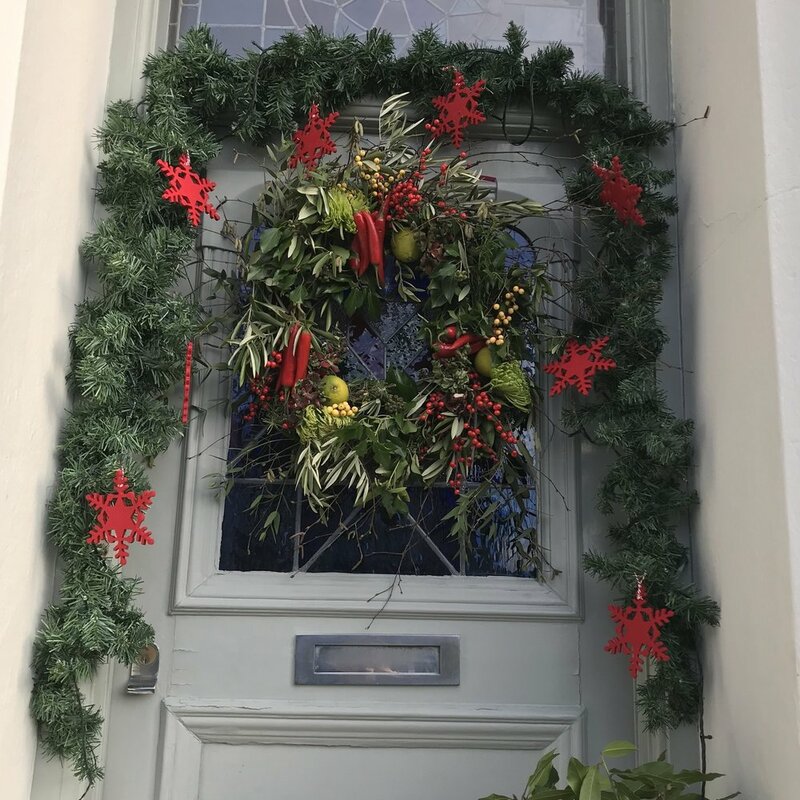 Mandy’s front door decorations include foliage from her garden. Cut back ornamental shrubs. Use the foliage for decorations and a homemade Christmas wreath. If you have bulbs in the lawn put barriers around so they do not get chopped down or trampled on, early narcissi are already appearing. 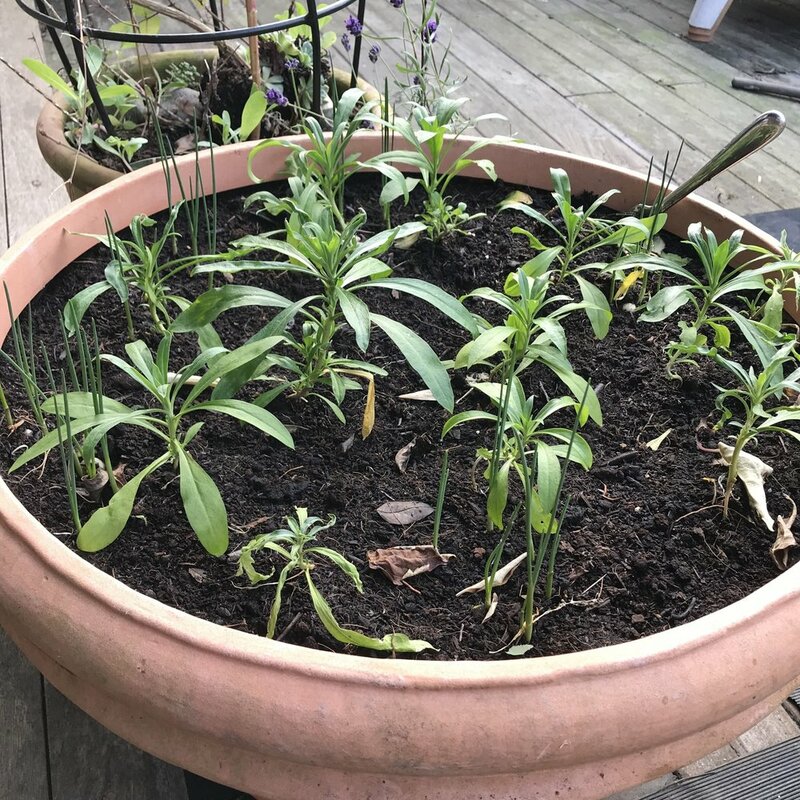 If you are a serial sewer you can use your old sewing reels as pot feet, elevating the pots of the ground protects your plants. Move your potted succulents into dry sheltered area of the garden, away from the wet and cover with an old sack if servers frosts are forecast.